Office 365 apps are now available for purchase and download from the Mac App Store. What does this new mean to IT administrators? Microsoft had a very special gift for the Mac platform which celebrated its 35thbirthday yesterday – Office 365 apps are now available for purchase and download from the Mac App Store. What does this new option mean to IT administrators? Microsoft wants to help enterprise users migrating from antiquated legacy Windows 7 kit to new platforms – but wants to make sure they keep using its cloud-based business solutions when they do. (Microsoft will “gladly trade a Windows user for a cloud user,” Jam,f CEO, Dean Hager, recently said). 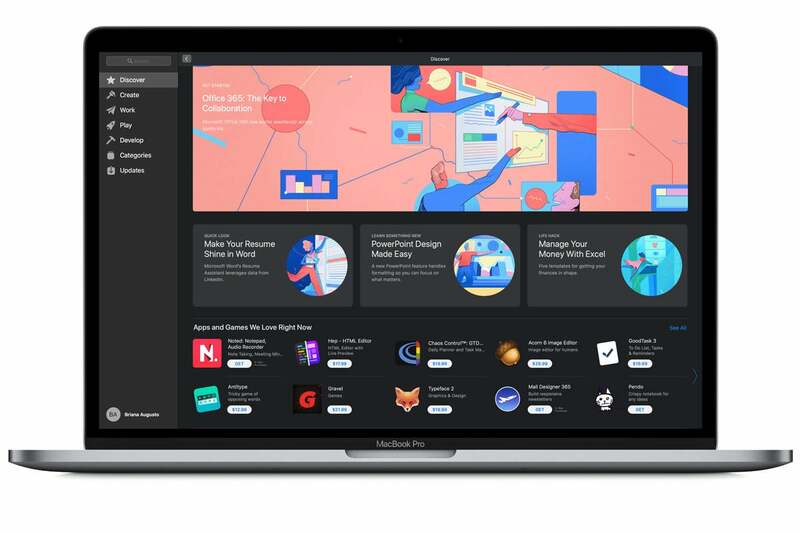 Mac users now have three ways to get hold of Office 365: Online directly from Microsoft, in a retail package, or directly from Apple’s Mac App Store. You can purchase the complete Office 365 collection. Individual installs of Word, Excel, PowerPoint, Outlook, OneNote and OneDrive are available (The latter two apps have been available for a little longer). The Office apps provide the very latest production version of Office on the Mac. Word, Excel, PowerPoint, and Outlook require an Office 365 subscription to activate. Microsoft Teams and Skype for Business are not available through the Mac App Store. The code used for the Mac App Store installation is slightly different than that used in other distributions. These differences are principally to support distribution via the App Store, which means that Software Updates are also distributed via the store, rather than using Microsoft’s slightly clunky Auto Updater. This also means Mac users will be presented with new Office 365 features “more often”, with the company planning to introduce new features every month for Office 365 subscribers. How might this affect my business? Some enterprise users may want to explore tying their Office 365 licenses in with the Mac App Store and their own existing computer and device deployment systems. In part this is because it makes it very easy for busy admins to provision multiple Macs remotely – computers simply download the software from the Mac App Store during initial set-up, and permissions can be managed in the console. This won’t suit everyone, of course, and it is still possible to provision Microsoft’s productivity suite from internal CDN servers or other existing methods of distribution. Microsoft has updated its Office 365 deployment guide to reflect that its Office suite is now available from the Mac App Store. The document may contain additional information relevant to your unique enterprise deployment, but this is some of the most salient information. There are a few limitations. The first snag is that perpetual licenses won’t work: “Perpetual licenses, including Office 2019 and Office 2016, are not supported with Office apps available from the Mac App Store,” Microsoft explains. The second limitation is that while consumers can acquire Office as a bundle from the Mac App Store with a single click download, IT administrators must deploy Office apps on an individual basis. You cannot distribute Office apps through redeemable codes. How do I deploy Office 365 from the Mac App Store? Jamf Pro is a good example of an EMM that can handle this task. As an additional bonus, Jamf Pro using admins can now provision and login to Macs using Microsoft Azure AD credentials, which makes Apple’s platforms even easier to integrate into existing ecosystems. The Microsoft note explains that Office supports managed distribution, which means your MDM system can install Office even in the absence of an Apple ID from the end user. How will software updates work? Office apps installed via the Mac App Store will be updated via the App Store. Microsoft recommends using content caching in order to expedite software updates when managing large numbers of seats. You can tell which version of the software (Mac App Store or from Microsoft) you have by finding the Office app in your Applicatoins folder, control-click the app icon and choosing Show Package Contents. In the Contents folder look for an item called _MASReceipt (Mac App Store Receipt). If you find it then you know that this installation comes from Apple’s store. If you are part of the Office Insider program then you’ll be used to receiving regular updates and new features via Microsoft’s own updating systems. However, the Office apps sold via the Mac App Store do not support the Office Insider program, so this won’t work for you if you need Insider access. Can I convert to Mac App Store version of the apps? “There is no automated process for performing a CDN to Mac App Store conversion,” Microsoft explains.